Tell me how awesome this looks.... I can tell you how awesome it tasted. Chef Jouvens Jeans made such a creative dish with ingredients that just make sense! 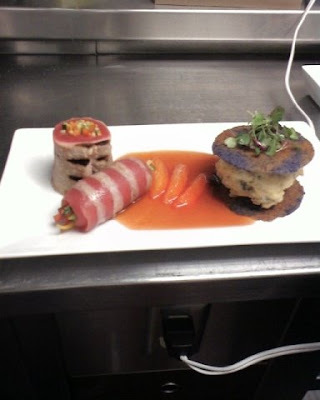 Well on the left side you have Ahi Tuna Roulade that is rolled with Julienne Vegetables then grilled. The sauce is a Blood Orange Gastric. The tower on the left is two Purple Potato Tuiles.... Now guess what's in the middle? Stir Fried Rice wrapped in Nori and Tempura Fried! A light dish that looks complex but taste so simple, because all of it goes so well together.... now that's just amazing.